One delicious recipe from my old Williams-Sonoma 'Mediterranean cooking' cookbook. This simple dish is one of many favorite dishes that often show up on our family dinner table and so far has not failed to please the crowd. They work as appetizer by themselves, or as main course together with rice pilaf and steamed vegetables. Peel and devein the shrimp, leaving the last segment of the tail fin intact. Set aside. In a large bowl, whisk together lightly the lemon juice, paprika, cayenne, cumin, garlic, parsley, cilantro, olive oil, salt and pepper. Add the shrimp into the bowl, mix with the marinade to coat evenly. Cover and refrigerate for 2-4 hours. Prepare a fire in a charcoal grill or preheat the broiler (griller). 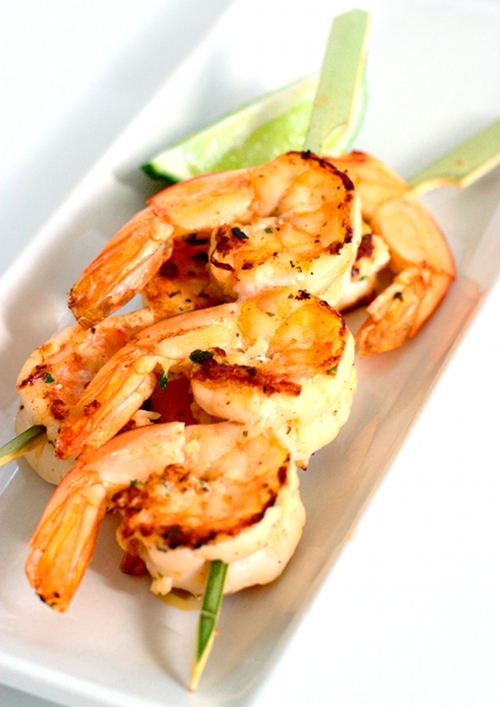 Slip the shrimp onto bamboo or metal skewers (6-8 shrimp on each skewer). Grill the shrimp, turning once, until pink, about 3-4 minutes on each side. Brush with the remaining marinade if desired. Serve immediately. This is a must try as I love all things shrimp. It looks very appetizing! Oooh, these look perfect! I love shrimp, and the charmoula sounds like a wonderful touch.